Underground cables are, of course, meant to be installed or laid under the ground. The reliability of underground cable network highly depends upon proper laying of cables, quality of cable joints and branch connections etc. There are three main methods of laying underground cables, which are - (i) direct laying, (ii) draw-in system and (iii) solid system. These three methods are explained below with their advantages and drawbacks. This method is the most popular as it is simple and cheap. 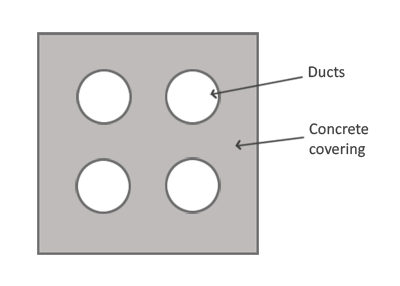 The cables to be laid using this method must have the serving of bituminised paper and hessian tape so as to provide protection against corrosion and electrolysis. The direct laying procedure is as follows. A trench of about 1.5 meters deep and 45 cm wide is dug. Then the trench is covered with a 10 cm thick layer of fine sand. The cable is laid over the sand bed. The sand bed protects the cable from the moisture from the ground. Then the laid cable is again covered with a layer of sand of about 10 cm thick. 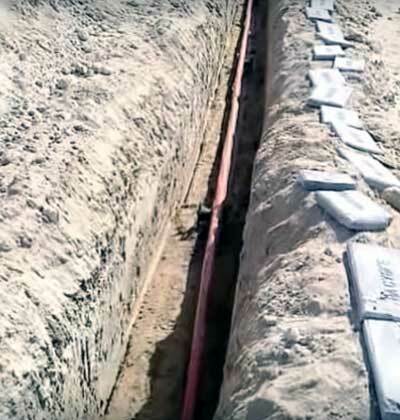 When multiple cables are to be laid in the same trench, a horizontal or verticle spacing of about 30 cm is provided to reduce the effect of mutual heating. Spacing between the cables also ensures a fault occurring on one cable does not damage the adjacent cable. The trench is then covered with bricks and soil to protect the cable from mechanical injury. Heat generated in cables is easily dissipated in the ground. To install new cables for fulfilling an increased load demand, completely new excavation has to be done which costs as much as the new installation. Alterations in the cable network are not easy. Identifying the location of a fault is difficult. This method can not be used in congested areas such as metro cities where excavation is too expensive. In this method, cast iron or concrete pipes or ducts are laid underground with manholes at suitable positions along the cable route. The cables are then pulled into the pipes from the manholes. Usually, an additional pipe/duct is also provided along with the three cable ducts for carrying relay protection connections and pilot wires. Distance between the manholes should be such that pulling in the cables is easier. At corners or while changing the direction of route, radius of the corners must be longer. The cables that are to be laid in this way need not be armoured but must be provided with the serving of hessian and jute in order to protect them when being pulled. Repairs, additions or alterations to the cable network can be easily made from manholes without re-excavation. In this method, as the cables need not be armoured, the cable jointing procedure becomes simpler. Maintenance cost is quite lower. Fewer chances of fault occurrence due to the strong mechanical protection provided by the system. The initial cost is very high. Due to unfavourable conditions for dissipation of heat, current carrying capacity of the cables is reduced. In this method, the cable is laid into troughing of cast iron, stoneware, asphalt or treated wood. When the cable is laid into the position, the troughing is filled with a bituminous of asphaltic compound and then covered over. Cables to be laid in this manner could be just lead covered as the troughing provides a good mechanical protection. This method is very rarely used nowadays as it is more expensive and requires skilled labour and favourable weather conditions.